Academy President and CEO Dr. Thomas P. Rosandich (right) receives the Statute of Liberty Club’s and The Wiegand Foundation’s Liberty Award from Jack Scharr (left) for his efforts to improve the sport profession around the globe. Academy President and CEO Dr. Thomas. 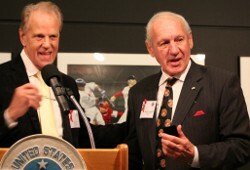 Rosandich earned the Liberty Medal from the Statue of Liberty Club and The Wiegand Foundation for all his contributions and service to improving sport education in the United States and around the world. Academy Vice President, Chief Academic Officer and COO Dr. T.J. Rosandich is traveling in February to Gabon for dedication of its new 40,000-seat soccer stadium in Libreville that is hosting the African Cup. Dr. Rosandich is also leading a legacy study on the future uses for the facility. Betsy R. Smith, the Academy Director of Academic Administration & Continuing Education, was selected by the Professional Tennis Registry (PTR) as the Member of the Year for the state of Alabama for her contributions to tennis and the recent partnership of the Academy with the PTR on continuing education. Smith will receive her award at the General Membership Meeting on Feb. 24 during the International Tennis Symposium. Rick Rush, the Academy’s 2011 Sport Artist of the Year, helped raise money for Christmas toys for poor children in the Dominican Republic. The Tuscaloosa, Ala., painter lent his talent to Global Effect, a Panama City Beach, Fla., charity, with a show of his artwork. Former LSU basketball basketball coach Dale Brown, who was an Academy Board of Visitors member, has a new motivational book out, “Getting Over the 4 Hurdles of Life,” and he is the subject of a new documentary-style movie, “Man in the Glass,” which is scheduled for a national release on DVD in February. Jim Abbot, the winner of the Academy’s Mildred “Babe” Didrikson Zaharias Courage Award in 1986, now works as a motivational speaker. You can now follow the former Major League Baseball (MLB) pitcher, who played despite having been born without a right hand, on Twitter or visit his website.